The first documentary about the life and achievements of Teddy Kollek, mayor of Jerusalem for 28 years (1965 � 1993). Kollek tells his fascinating life story � from his youth in Vienna to his active involvement in the creation and development of the State of Israel, especially the establishment of close ties with the U.S. 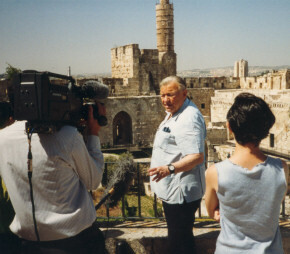 The documentary profiles a unique man, whose passion and determination made Jerusalem what it is today. An AVA production in cooperation with EO Television (Netherlands) and WDR Television (Germany).